Is It All A Matter of Faith? Recently in a debate with Scientific Christian over on Nan’s blog he presented a clip that I don’t know was supposed to represent game, set, and match about something, but I’m not sure what yet. It seems that he was claiming that we all use faith and so any form of faith is just as valuable as the next. In the clip, you see Dawkins debating with Dr. John Lennox. Lennox is big into using this argument against people he debates with so let’s investigate this a bit more carefully. I have argued before that I think faith is an important part of who we are as humans, and an important one at that. I have not changed my view as faith being a fundamental human quality. But so is curiosity and so is reason. If faith alone were the only way determine reality it simply would be insufficient. First things first, let’s assume that Lennox’s argument is a good one. Even if that were true, and he caught Dawkins, it still isn’t proof of God. It is only proof that faith sometimes works or that we all utilize faith to some degree. It certainly doesn’t always work. Now Dr. Lennox himself warns against the dangers of blind faith. He would argue that no Christian (and I am sure follower of any religion) would say that they don’t have blind faith in their religion. There is at least some evidence. But if we, just for arguments sake, take blind faith as the extreme at one end (and I would say people who think God is just going to heal their child and they don’t give them medicine is close to that end) and that something like having faith that the sun will come up tomorrow is being at the other extreme, we can easily see that there is a world of difference between those two extremes. 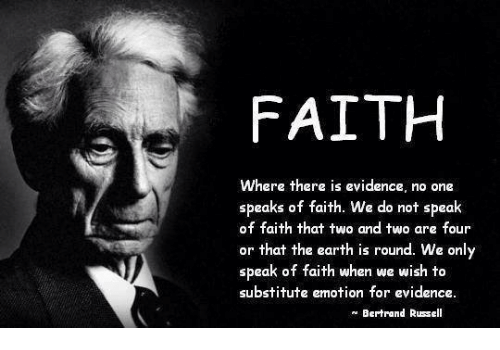 So, at the outset, it is intellectually dishonest for anybody to make claims that just because you use faith and I use faith makes what we have faith in as equally valid. As Dawkins points out in the clip and addresses in more detail in the full debate, is that the key is in the evidence. So why do the two points of view not work out to be equivalent? As I have argued before (here and here) and will not go into detail here, it’s because of what we consider valid evidence. If parents who let their children die on the hopes that prayer would save them were using the same evidence as Dawkins’ uses in having faith that his wife still loves him, then both would have equal predictive capability. And this is an important point that Dawkins tries to make is that even if we are all using faith to some extent the degree to which the work model we have of how any phenomena works must be predictive. Given our model of the solar system, each time the sun does come up it is further reassurance that are model, which would predict the sun would come up (really the sun doesn’t come up of course we rotate on our axis), is in fact verified. So while one could argue that it is a matter of faith that I think the sun would come up tomorrow, the evidence to which I have built that faith, is far different than those who would use faith that God will intervene on their behalf through prayer. Of course, one might ask, “Why do people think prayer works at all?” If that evidence is so untenable why build any faith on such things? The answer to that questions requires a greater delving into human cognitive biases but largely it is due to our propensity to make Type I errors (false patternicity) and our cognitive bias to remember ‘hits’ and disregard misses. And this speaks to why the scientific method is so important because it requires careful methodology, it requires replication, it requires that we be able to build off of older principles to new ones reliably. One then often argues, well clearly you have faith in the scientific method. And I do, but this again is because the scientific method works. If were to use the scientific method to uncover some knowledge of the world and at every turn I was not getting reliable results, then this would be cause for me to question the very way I was trying to discover how things work. We’ve seen the scientific method be effective so many times, that we can therefore have faith that it will be reliable again. Once again we see how being predictive plays a role in how faith in the scientific method is different than a faith in a personal God. Finally for as important as I think faith is to our lives, we also must be willing to change the things we have faith about. If I do have faith that my wife loves me based on a certain set of evidence. Even if I’m convinced that evidence is good, should that evidence change, or it’s pointed out to me that I’m not using reliable markers of one person showing love to me, then there is no reason for me to continue to have faith along that avenue. What we have faith in, is not set in stone. What an unsuccessful species we would be if that were the case. What are we doing? Does anybody know? Where are we going? Is there anywhere to go? If a purpose was given to us, why do so few people show it? If God suddenly appeared would anyone know it? And if purpose is ours, can we make it good? Do we shed that weight by pulling others down? Wouldn’t we all feel it a little bit less? Is anyone paying attention at all? Can we open hearts and minds that are shut? What kind of future are we paving? Are we even a species worth saving? What does it all ‘mean’? I was listening to an interview with Charles Murray recently. For those of you who aren’t familiar with him, he is the person who wrote, what became a controversial book, The Bell Curve. Through some careful research he showed that white people had a higher IQ than black people, and had a lower IQ than Asians. He was labeled a nazi and a racist, and many other things for this research. Now I don’t want to get into this debate, I think that as a scholar his methodology was sound, but what his book doesn’t answer the reason for such differences. Is it genetic? Is it environmental? I am sure it is more often the latter. The more important question is, what is the value of such research? Is it really doing any good, or does it just feed the bias of a racist, while angering others? If you’d like to listen to the interview, I think you will find him cordial, but it’s not really the main thing I want to talk about, although what I do want to talk about is mentioned several times throughout out the interview, and that is what differences really mean. How should perceive differences in IQ or any quality for that matter? There are certain issues that have become very taboo in our society, and things become emotionally charged quickly when one tries to talk about them. These includes talk about differences between people of different races, different religions, different genders, and different sexual orientation. A discussion about any statistical differences between different populations along those lines usually doesn’t end well for the person trying to bring them up. And it’s possible that there is little value in discussing these differences, but I thought a short post to really visualize things from a statistical perspective is important, because I think people often don’t view the statistics properly when these issues come up. And it’s true not only for these “hot button” issues, but a lot of issues in which scientists discuss differences between populations. For many studies, particularly in the social sciences and biological sciences you will find data is distributed. For any two variables that you are trying to find a relationship with, you will find the outcomes range across a particular set of values. For instance, if we were trying to determine how depression influences someone’s eating habits, even in a perfect experiment we would likely find that most people eat more to comfort themselves. Perhaps a large majority would say take in 50% more calories than they normally would. But a small minority would take less calories, perhaps -20%, and another small minority would take in twice as many calories. This is called a frequency distribution. We plot the range of outcomes versus the amount of time those outcomes occur. There are several types of distributions. 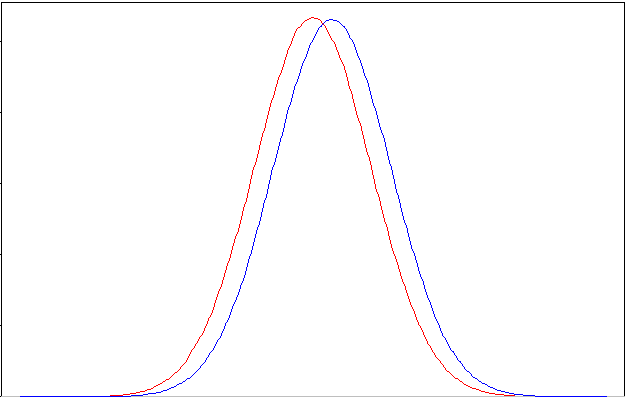 There are skewed distributions, bimodal distributions, and then there is the normal distribution. This is generally the most common one and the easiest to say something about statistically. As our sample size increases, a relationship between two variables that are related to each other should get closer to a normal distribution. I realize that I am simplifying here, but my goal is not to get deep into statistical theory, but simply to illustrate why differences between populations might be more or less meaningful. This graph comes from an interesting discussion about differences between populations of men and women. 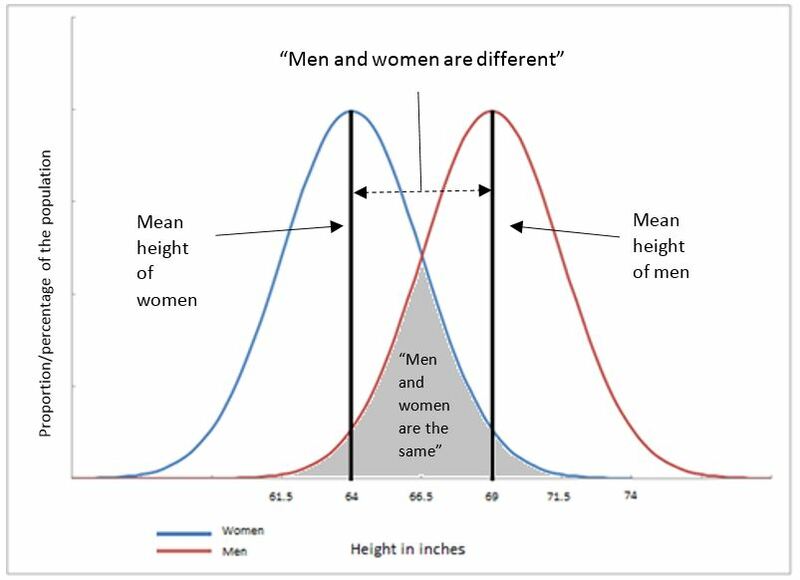 In this example we can see that the average height of women and men are different, but of course no one would say that any given man will be taller than any given woman. What this means is that if we are talking about people there is very little we can assume a priori meeting any individual member of a group. We can only say this is how things are on average and we can decide if anything should be done about it or anything can be done about it if we desire those averages to be the same. Averages are talked about far more than perhaps they should. While it is a good summary of data, frequently the devil is in the details and we can say little concrete on averages alone. Rarely do researchers themselves so narrowly focus on the statistical analysis they do, but I think much gets lost when a journalist tries to report on the findings. The average, being the easiest to understand, is thus the easiest to report on and that’s when people start making assumptions about what the data are actually saying. Read an actual paper and you will find all sorts of other statistics discussed. Averages are all too common though. We get them in school, they are reported in sports statistics, the news. But one has to be put it in context of the entire set of data. Let’s not define people by an average. What is equally relevant is the variance among the population as well. People are often easily fooled by statistics because they don’t understand them adequately. Statistics also deals with probabilities. Something we are terrible at from an intuitive level. If you are interested in having a better understanding of basic statistics, I found this website to be quite helpful. I believe that by having a better understanding of statistics we can have more meaningful reactions to the findings of data analysis, and thus have more meaningful discussions about what we can really conclude from those data.